Compass Youth: MARK MCDONALD FOR LABOUR PARTY TREASURER? MARK MCDONALD FOR LABOUR PARTY TREASURER? There is a challenger to the status quo, a challenger for the position of Treasurer of the Labour Party - His Name is Mark McDonald, Human rights Barrister and grass-roots campaigner. 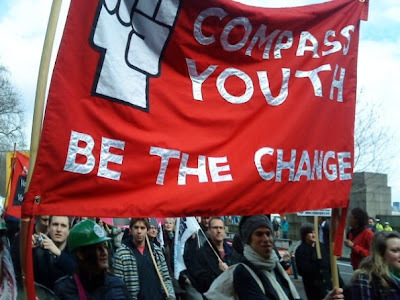 Samuel Tarry, Chair of Compass Youth, recently interviewed him on his quest to put the grassroots back at the heart of the Labour Party putting questions from Compass Youth members directly to him. Mark's campaign was in fact launched from the Labour Home grass-roots website after Labourhome.org Editor Alex Hilton in December challenged the grassroots to find a candidate for the role of Treasurer of the Labour Party. We at Compass Youth are always interested in bottom up campaigning and the democratisation of the Labour movement. So decide to find out more to help our members make their own minds up about this important position. Compass Youth would like to thank Mark for the time he has taken to give us an interview. Q: How will you ensure that you remain accountable to the membership and as independent as possible rather than becoming part of the party machinery? "The entire tenor of our campaign is one of re-engaging party members in the running of the party. The fact that this post is so rarely contested means that it has ceased to be accountable. Democratic election is the first step in accountability. But further than this, I’m keen to use both traditional and modern methods to ensure there is a constant dialogue with members over the course of the two year term. I’d like to visit as many CLPs as possible and attend party meetings, but there is an entire arena of online engagement that is underused by the party, which I would like to address in the role of treasurer." Q: Looking at the issue of party funding what five key reforms would you make? How will you lobby for these reforms within the party, PLP and Unions? "There has to be a complete change in approach from the leadership in how we reform our party. I’m not approaching this Treasurer position as though it confers upon me the right to make pronouncements as though I am expressing the unified voice of the members and affiliates. We must have a party treasurer who considers it his or her responsibility to seek out the members and affiliates who can contribute to reforming our party finances. This means going to every region and meeting people and bringing their ideas and priorities back to the NEC. I have my own opinions: one of which is that we should formalise our training procedures so that our officials and skilled volunteers are tested and certified rather than simply presumed to have understood their training. Secondly, it is clear we need the party to facilitate internal elections better, providing fund-raising and member contact facilities to ensure they are in the hands of trained professionals, and are data protection and electoral law compliant, rather than people whose only qualification is their enthusiasm for the candidate. But you’re right, we have to lobby for these changes to be made once all the proposals are known. Very simply, I would suggest that when members and affiliates have been fully engaged in the process of developing policy, they are less likely to oppose its adoption. Certainly, changing the way we operate really does demand a more streamlined method of making party rule changes while respecting our stakeholders’ sovereignty over the rules." Q: Taking the issue of Trades Union affiliation to the Labour party - how do you propose that this financial link is not broken and that the Union link is enhanced at the same time as making union funding of the party more transparent? Would you support the proposals put forward by Unlock Democracy for preserving the link - increasing transparency? "The union movement and the Labour Party are indivisible; trying to separate us is like trying to un-boil an egg. I am proud to be a member of the only political movement in Britain that engages millions of people. However, it is clear that we would be a stronger movement if we worked more closely with individual affiliated Union members. For example, I supported Harriet Harman’s proposal in the deputy leadership election that young affiliated union members should be given automatic Labour membership for a year, a concept that could be extended far further. However, I do oppose state funding of political parties, which is a move that could reduce the Labour Party from being a membership organisation to being a supporters club. There is the scope for the state providing cross-party support for certain facilities – for example, for high quality training in electoral laws. I am not convinced that blunt measures, such as national spending caps, are effective in the longer term, as they tend to provide scope for many loopholes, which political operators tend to seek out. I would keep the national cap, but certain “surgical strike” regulations could serve to be far more effective. In particular, looking at capping billboard poster site spending and potentially banning certain practices that have high costs – just as we currently ban TV advertising." Q: Do you agree that trade unions should be able to participate fully in the political process but that any system of affiliation needs to be open, transparent and based on the active consent of the individual. How would you propose that this is done? "Yes, and it is clear that the union movement recognises this and seems to be taking action to ensure forms etc are clear to their members." Q: Given the damage that the recent party funding scandal has done to Labour and to politicians standing in general (The Conservatives were equally implicated) what would you aim to do in your first 100 days in office to rebuild the trust of the membership and the public? "I backed Hilary Benn for the deputy leadership, I even donated to his campaign fund, because I felt that although all the candidates had strengths, none of them are defined by their integrity in the same way that Hilary is. I got to know his campaign team pretty well and running through the team, as though it were in their DNA, was a respect for Hilary’s integrity. In marketing terms, they had faith in their brand and no individual was prepared to make a mistake that would damage that. Our problem in our party is that we seem to have lost faith in our brand, when our values remain as noble as ever they were. We will win back the trust of the British people when all of us, volunteers, affiliates, employees and politicians express a level of faith in the Labour “brand” that ensures that mistakes aren’t made through carelessness or recklessness. Can this be achieved in 100 days? I’m not sure but we can start to address these issues." Q: To set yourself apart from other party apparatchiks and as an act of solidarity with the lay membership would you take an average workers salary instead of that offered by the party? "This is a voluntary position and attracts no salary. As a barrister, I presume winning this position will mean I am less available to work in court and so this would represent a pay cut." Q: How will you use your position to bring about a more social and democratic party? "As I have stated before, I believe the diligence of our financial arrangements is bound up with our internal democracy. The treasurer post has atrophied because it has lost its mandate from the membership – due to the rarity with which this election is ever contested." Q: On a personal level I am sure that Compass Youth members would be very interested to hear more about your advocacy work, particularly the work training young lawyers in Palestine? How did you come to be involved in this and how does it inform your politics? "This is of course a very separate issue than the election of the Treasurer. However Palestine is an issue close to my heart. I have worked for many years to raise the issue of the Palestinian people and last year, as part of a human rights project funded by the Foreign Office, I went to the West Bank to help train Palestinian Lawyers in international human rights. My experience of the everyday Palestinian was very humbling. There was a desperate need for help and for the international community to step in and stop the occupation which is everyday tearing apart the lives of the ordinary Palestinian. Historically, the core values of the left have been the protection of vulnerable from oppression and state abuse. Domestically the erosion of individual rights in last century led to increasing calls for a UK Bill of Rights, and the incorporation of the European Charter into UK law became the defining moment of the first New Labour Government. Internationally the campaign against South African Apartheid, the rights of the people South America and civil rights marches in the US have always been embraced by the mainstream left. Equally and rightly, the left supported the right of the Jewish State. But I feel that sometimes the mainstream left forgets the plight of the Palestinian people. At conference I attended both and the Israeli and Palestinian fringes and was taken-back by the contrast between the two events. The Labour Friends of Israel attracted over 300 attendees, the Foreign Secretary and the Prime Minister both gave speeches on their support for Israel. At the Palestinian event, there was not one Member of Parliament present. And although the Palestinian Ambassador had travelled to Bournemouth, no senior member of the labour party was there to greet him. I raised this issue with a number of MP’s and at the same time discussed greater sanctions and maybe the need for a boycott. Each time I met with scepticism and an unwillingness to criticise Israel. There is a need for the left to constantly raise the issue of Palestine which I will continue to do until, one day, like South Africa there is peace. " Q: What do you think of the following six part recovery plan for British politics to clean up its image and practice and encourage political parties to re-engage with the public at a local and personal level, where it is most effective. "Again, I don’t think it is for the Treasurer alone to consider these matters when they refer to general party funding proposals rather than Labour-specific practices. However, I generally think that the more complicated the proposals are the more expensive they would be to operate and enforce and the greater number of loopholes will be found. I oppose state funding of political parties, except perhaps in terms of training and ancillary services. Voter guides make sense. Balancing between local and national spending limits is overly complicated because already parties find ways of “deeming” spend items as national rather than local if they need to. It wouldn’t really have much impact. Caps on individual donations aren’t necessarily the answer either as that provides a further motive to be less transparent. What if, when I die, I want to leave my worldly goods to the party? Why shouldn’t I be allowed to do so however much that may be? There are a lot of proposals that could come under the heading of “Electoral Reform”. I do support a better democracy and a more proportional voting system would make sense. I also support a 100% elected Lords and votes for 16 year olds." Q: What do you make of the decision of Peter Watt, apparently his predecessors and almost certainly a lot of others within the Labour party to break the law in covering up the identity of a major party donor? With the Wendy Alexander debacle, a similar dismissive attitude about the law seems to have been in place. But no party has clean hands, least of all the Conservatives who continue to use unincorporated associations to legally protect the anonymity of their donors. How will you ensure that you will be 'whiter then white' and drive through the implementation of new financial management systems to make this unthinkable in the future? "As I stated earlier, once we all start to regain our faith in the Labour brand, there’s a general motive to double check and ensure things are in order. I don’t believe the Labour Party is corrupt, though it is clear that mistakes have been made. It’s also unfair to seek out scapegoats and on reading the news articles, it’s clear that the David Abrahams arrangements were in place well before Peter Watt was appointed General Secretary of the Labour Party. Wendy Alexander is your second example and you have to remember that she took a £950 donation from someone that she and everyone else thought was a British resident. The donor hadn’t declared that he was Channel-Islands based, and while Wendy would have benefited from having someone double-check the donation on her behalf, there was no corruption. We have to be clear that our aim is to make complying with our legal obligations a central part of our work as party activists, not conducting witch-hunts." Q: Sum up in one sentence why Compass Youth members ( those who are also a Labour party members) should vote for you? "Labour needs a treasurer who counts, who believes in drawing the membership closer to the leadership of the party and who will work to restore Labour’s reputation with members and the public." Mark is a human rights barrister and a long standing Labour activist and has fought for many years against abuse of power. He was an operating theatre assistant and NUPE shop steward before he took his A-levels as a mature student, and later a degree, to become a lawyer. And now working in law he continues to fight injustice, travelling to the Middle East to train Palestinian lawyers, to the USA to assist defence teams in death penalty cases and running the London Innocence Project, which provides pro-bono support for reviewing miscarriages of justice. Why do you support Ken?